American Cream Draft Horses are the only draft horse native to the U.S. They were developed in 1905 in Iowa during one of the greatest declines in heavy horse use in history. The American Cream Draft originated in the United States in the state of Iowa in 1905. American Cream Draft Horses stand on average 15.2 -16.2 hands high and are a medium-heavy draft horse. They weigh between 1600-1800 pounds and a large stallion can reach up to 2,000 pounds. They have well-muscled shoulders, a large body and a calm and quiet demeanor. They are easy to train, strong, and eager to please people. They have a cream coat, pink skin and amber colored eyes. American Cream Drafts are primarily used for driving and agriculture work, but they can also be show and riding horses. The American Cream Horse Association was developed in 1944 & the breed was recognized officially in the same year by the Iowa Department of Agriculture. The flagship mare “Old Granny” (who lived from 1905 to 1925) is considered the “grandmother” of this breed. Purchased at auction by Mr. Harry Lakin, “Old Granny” was bred to a number of different colored draft breeds in the hopes of maintaining her stature and creamy color. A Mr. C.T. Rierson is considerd to be the founder of the breed. In the 1930’s Mr. Rierson and a handful of other breeders started line breeding and inbreeding to establish the Cream Horse breed. 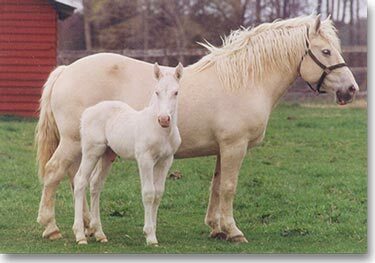 They found that breeding a "palomino" draft, that is one with dark skin, to the creams who had pink skin created an undesirably too white horse, and lost some of the good cream qualities. So they concentrated their breeding to getting the pink skin, cream coat traits with superb results. Unfortunately, the mechanization of the times, saw replacement of farm animals with heavy equipment such as the tractor in the 1940’s, which caused a sharp decline in draft horse use and population, especially the American Cream Draft. Their numbers decreased sharply and the breed faced extinction. The US census in 1925 showed more than 98,000 registered draft horses, but by 1955 there were less than 2,000. Many good farm horses in the United States were hauled to auction, slaughtered for dog food, or sold due to hard economic times. It was a very sad time for draft horses and it is believed that the only reason America Creams still exist is because a handful of dedicated horse farmers hung on to their horses through the tough times. In 1982 a revival attempt of the American Cream Draft was made by the American Cream Horse Association. According to the August 1983 edition of Smithsonian Magazine it was believed the Creams were extinct. The organization today has focused on restoring original bloodlines and is continuing that effort. Today the breed numbers of the American Cream are still under a hundred animals, they are slowly increasing, but only time will tell if this original draft horse will make a full comeback.